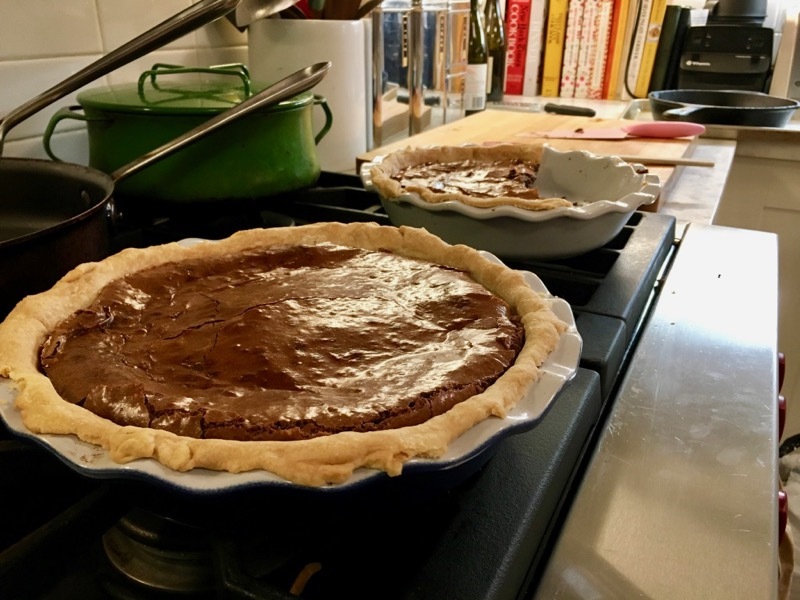 That’s what Andy said when he tried a bite of the inaugural Chocolate Chess Pie we baked on Friday: Maybe the best pie ever. Before I get into the details, let me just remind the readership at large here that Andy loves nothing more than a superlative. (<- Which is itself, of course, a superlative.) About the tomato sandwich he eats during the tomato’s super-short season, he says: I could seriously eat one of these every day of my life. At Blue Hill last year, when he tried Dan Barber’s reimagined hot dog — made mostly from salvaged beet scraps — he was like, How is this kind of thing even POSsible? On the lower-brow end of the spectrum: A bite of a Ruffles Cheddar-Sour Cream chip elicits a I’ve literally never tasted anything as good as this. Seriously. Oh my God. 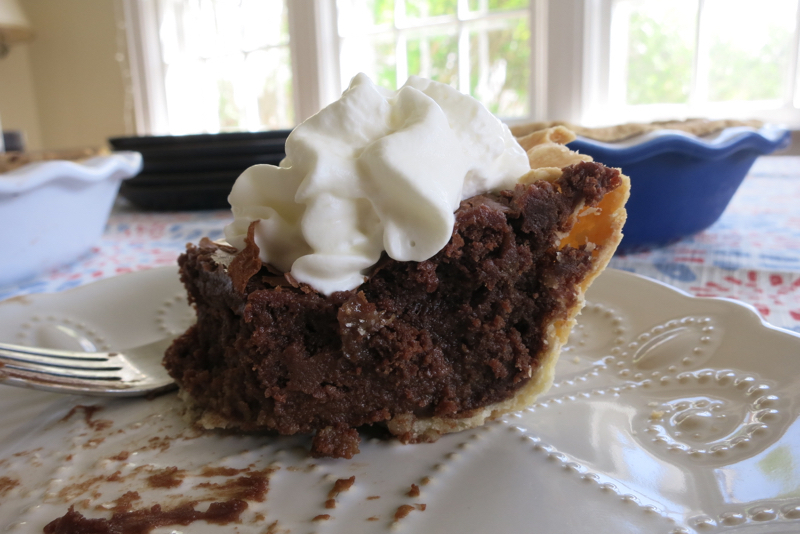 Nonetheless, I’m going to just come out and say it: This Chocolate Chess Pie was maybe the best pie ever. The astute DALS reader might remember that the girls and I — without Andy — had tried our very first slice down south at Charleston’s Hominy Grill a few weeks ago. The pie is a Southern specialty and for those of you who have never tried one, it’s like eating a slightly underbaked brownie inside a buttery pie shell. A subtle splash of coffee flavoring is mixed into the filling which otherwise requires probably everything you have in your pantry right now — chocolate, sugar, eggs (lots of eggs) and cornmeal. I’m told it’s the cornmeal that makes it officially Chess Pie. Here’s a close-up shot so you really get a feel for the fudginess. So while the rest of the food world is pushing rhubarb and strawberry and other spring-like fruit pies, I am taking the opportunity to counter-program with this lovely looking slice of heaven. The best thing? (Or maybe I mean the best thing ever?) 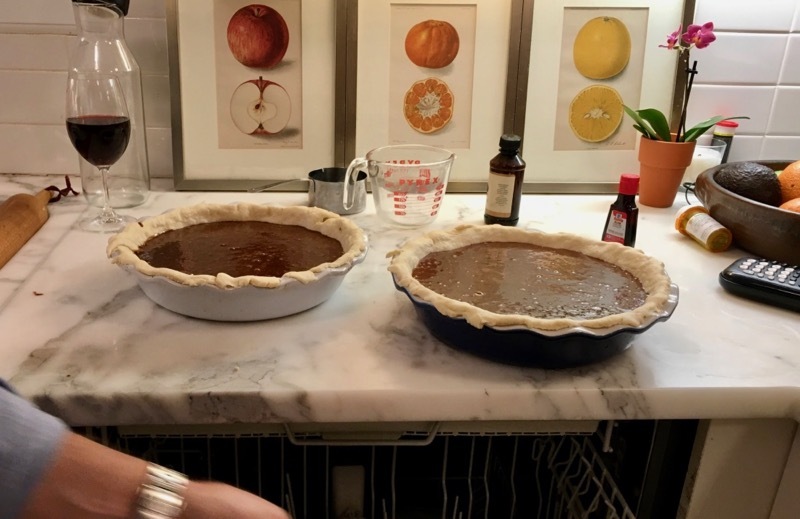 The recipe below is from Christina Hagen, the pastry chef at Hominy Grill and it yields not one pie, but two of them. This worked out very well last weekend when we were charged with bringing a baked good to the cello recital. One for them, one for us. Par-bake pie shells with parchment and pie weights in convection oven set at 315°F for 13 minutes. (Or 375°F for a regular oven.) Melt chocolate and butter together in a double boiler, set aside to cool. Sift sugar, cornmeal and salt together in a separate bowl. Whisk eggs, yolks, milk, vanilla and coffee extract/flavor into sugar, cornmeal and salt mixture. Add melted chocolate/butter whisking gently just to incorporate. Pour batter into prepared pie shells until about ¾ full. Bake with dial set at 315°F in the convection oven (or 350°F for regular oven) for about 50 minutes. Pie will puff up like a soufflé and then settle down while cooling. The girls ate the pie almost as soon as it came out of the oven, which was probably not the best approach. (But really, can you blame them?) Better to let it set and chill overnight in the fridge if you can wait that long. Top with whipped cream, of course. Related: What we brought to the cello recital two years ago. Wait, convection oven? Really? Wouldn’t baking in a regular oven be okay? Follow up: I made the recipe exactly as written (minus the crust – ain’t no shame in PIllsbury), and it was AMAZING. I’d advise waiting until the pie has fully cooled before eating; I thought it tasted best after 12h in the fridge. Eating it cold seemed to really make the vanilla and coffee extract (I used McCormick) shine through. Mmm, I love Hominy Grill, this looks so delicious! I’m terrified to par-bake a pie crust. The last time I tried it, using this same pate brisee recipe, the result was a shriveled, shrunken shell of its former self. I suspect there was too much water in the pie dough, but I can’t face that kind of disappointment again. I am definitely going to try this! I’ve had chess pie, but never a chocolate chess pie. And I love your description of Andy’s enthusiasms. My brother is like that. Everything is either the best ever…or the worst ever. Does Andy balance it out with that, or is he just always sunny? Until you’ve tasted Chocolate Chess PECAN Pie. Yes, according to Christina, you can bake in a conventional oven: Parbake shells @375 and bake pies @350 . I added instructions in the recipe above. Loving that there’s a pill bottle and TV remote in one of the pics… Pie looks great. It looks like the consistency of a brownie. Does it taste like a brownie. Yum. I like Isbell’s new album too. Do you think you could freeze the second pie (post-bake) for future enjoyment?? Holy smokes, this looks so great Jenny! All chocolate everything. Yes! Love the tablecloth in your pie picture! I LOVE Ruffles Sour Cream and Cheddar chips. When I was pregnant, I used to treat myself to a bag in the check out aisle, and eat them on the way home. It’s the only thing I miss about being pregnant. That fudgey-ness looks absolutely unreal. I feel like Charlotte, spelling out “SOME PIE” in a web. It’s just absolutely absurd and I have to make it right now, thank you very much. thank you for this pie recipe and love your contrarian turn vs berries, etc, (although I like those too!) This looks seriously dense in a good and chocolate-ly way! OOOOO!!!!!! I want to try this with a salty graham cracker crust. Or maybe a pretzel crust?! I made a half recipe this weekend. I ended up with a bit more batter than would fill my crust 3/4 of the way (to half some of those portions, I converted everything to g and ml and then tried to get as close as possible to things like 1/2 an egg). I put the extra batter into a couple mini tart pans and the strange people who don’t love pie crusts got a personal brownie. i halved the recipe and it didn’t come out like yours. i split the eggs by weight, it turned out to be 5 whole eggs and 2 yolks. i baked it at 315 in a convection even though that seemed strange. (i used my own pie dough). the filling was matte instead of shiny. it didn’t puff in the center and it looked almost a tiny bit broken after it baked, although it was perfectly smooth and shiny going into the pan. the inside was two layers. a very small syrupy layer at the bottom and then a thick fudgy layer like much too stiff pudding. i was very sad. I do not know why this didn’t occur to me the first time I read this post (on 5/9) but this is a traditional Kentucky pie and you made it the day before this year’s Kentucky Derby. Coincidence?? I think not. Inspired? For sure. 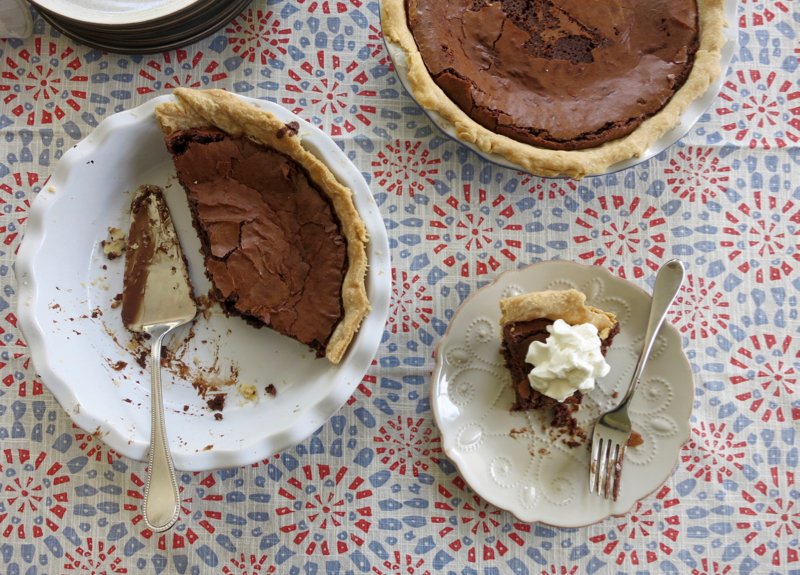 This is not the Chocolate Chess recipe but it IS a Derby Weekend Pie. Both pies are just so very good!! This was my rainy day Memorial Day activity! The pies were a huge hit! We talked about them all evening – the crust, the filling, we couldn’t get enough. I made this and it was disappointing as well. I followed it to a T (minus the crust-made my own crust) and the top separated from the bottom. The bottom was a syrupy layer and the top was a dry chocolatey layer. Hmmm…. Nicole & Sarah – I’m so sorry to hear your pies didn’t work out. That is no fun at all. I will reach out to Christina for troubleshooting advice. Please check back. I had the separation problem too! I made the full recipe, two pies, definitely had too much filling so I think I had pie pans that were too shallow? Also wondering if my chocolate and butter hadn’t cooled enough (it wasn’t hot, but it was still warmer than room temperate) Anyway, sad way to waste a lot of chocolate, butter and eggs! I did use a regular oven, and used a thermometer to make sure the temp was spot on.